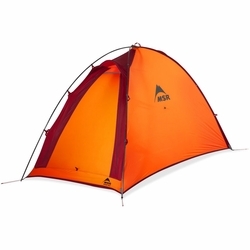 MSR Advance Pro 2 Tent. Engineered to meet the needs of professional alpinists, the 4-season Advance Pro™ 2 tent features an ultralight construction and a small footprint for easier pitching on high-altitude ledges. Its extreme-condition, single-wall design utilizes nearly indestructible Easton® Syclone™ Poles and reinforced guy-points. A unique pole sleeve allows the tent to be set up fast by one person standing in a single precarious spot—a critical advantage when space is precious in technical terrain. Proven in harsh environments like the Himalayas, the Advance Pro™ tent delivers reliable protection on aggressive summit assaults.